"The Godfrey Papers", Valerie Bary and Jane Spring, Journal of the KAHS no.20, 1987. GODFREY on p.62 of [Smith, 1756]. Research on the Godfrey family (and here) by John G. Knightly. 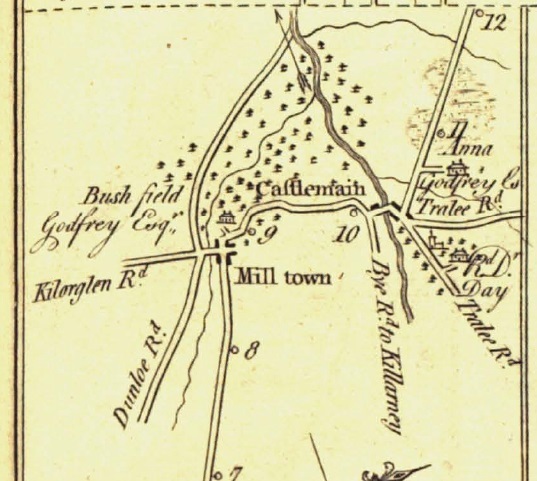 The Godfrey family were granted in 1668 the confiscated Spring estate of Kilcolman Abbey, near Milltown, Co.Kerry. They built a new house, Bushfield House, before 1700.
of Bushfield, Kilcolman, Milltown, Co.Kerry. He married, settlement 15 Aug 1761, registered 7th of [poss. Nov] 1763, see [Godfrey Papers], to Agnes Blennerhassett. Marriage settlement wit by "George Cashel", who must be George Cashell of Rathanny, Co.Kerry, the son of Agnes' 2nd cousin Sarah Rowan. Bushfield House was destroyed by fire c.1774. William soon after re-modelled a nearby tower house to live in. High Sheriff of Co. Kerry 1780-81. He was cr Baronet 1785. He died 23 Jan 1817 (or 19 Jan), age 78 yrs. Sir John Godfrey, 2nd Baronet, born 1763. 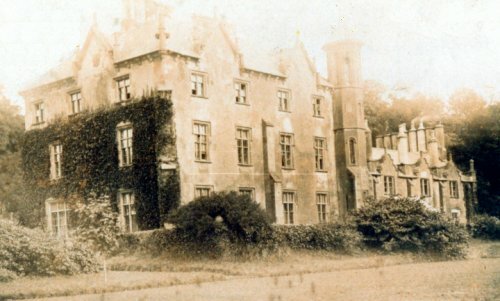 He built a new house at Kilcolman, called Milltown House, later called Kilcolman Abbey (or Kilcoleman Abbey). mar 1796 to Lucy Day and had issue. Bushfield on p.187 of [Taylor and Skinner, 1777]. 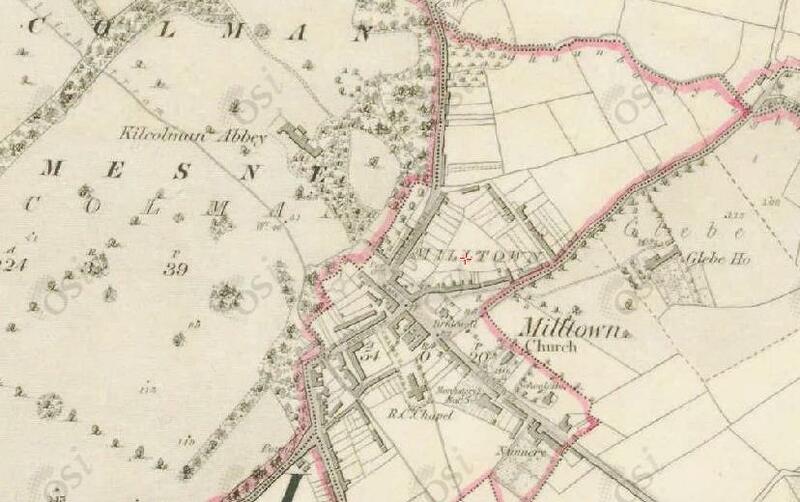 Kilcolman Abbey, Milltown, Co.Kerry, on 1829 to 1842 map. The house was demolished in 1970s. It is now vanished and a housing estate built on the site. See modern map and street view of entrance to estate. It is interesting that "Bushfield" was the name given to the Cashell house in Co.Tipperary. It had that name by 1763.